Quickly Hyper-Loads Muscle Tissue with Glycogen for Optimum Performance, Endurance & Recovery! Designed With A "Sustained-Release" Mechanism for Over 2 Hours of Stimulant-Free Energy! 100% Sugar Free & Gluten Free! Mixes Instantly: No Clumping or Gelling! 100% Pure! Banned Substance Free! Karbolyn represents the dawn of a new era of carbohydrate supplementation. 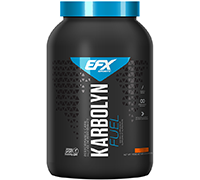 Unlike other carbohydrate sources, Karbolyn is quickly absorbed into the bloodstream like a simple sugar but without the typical spike or crash caused when your muscles run out of fuel. 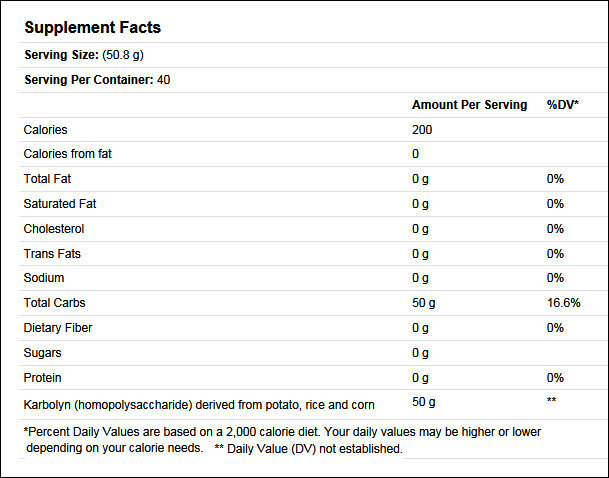 In fact, Karbolyn is a "homopolysaccharide" (relatively complex carbohydrate) that has been proven to be absorbed 18.21% faster (see chart below) than pure Dextrose (a simple carbohydrate), yet it still provides the sustained energy of complex carbohydrates. Carbohydrate sources such as unprocessed waxy maize starches are inferior for rapid glycogen loading and nutrient absorption. These starches have not been accurately processed to attain rapid absorption into the bloodstream. However, Karbolyn uses a proprietary multi-stage "Enzymatic Milling Process" to reach optimal molecular size. This yields a superior bio-engineered carbohydrate for quick gastric emptying without any side-effects (such as stomach bloating or cramping) and is rapidly absorbed into the bloodstream. Mix 1 scoop in a shaker cup with 10-16 ounces of water and drink 60 minutes before exercise.